When Chris visited Dishonored developers Arkane earlier this year, he told us the incoming follow-up is “very much a sequel to the original” and that we shouldn’t expect an overhaul. I’m totally fine with that, and the more I learn about what Corvo Attano and Emily Kaldwin will be doing in new setting Karnaca, the more excited I get. 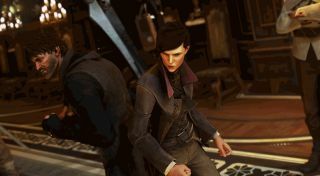 In a new blog post featured on Bethesda.net, Arkane’s co-creative director Harvey Smith and the game’s lead designer Dinga Bakaba explore both Corvo and Emily’s characters. They detail how the events of the first game have impacted the sequel, and how this has shaped Emily in particular—a child in the original, now 15 years older and a playable character for the first time. Her playable debut means she comes packing an arsenal of all-new special skills too. Mesmerize summons an entity from “the Void” that “enthrals Emily’s foes, allowing her to eliminate them or simply waltz past them untouched.” Domino, on the other hand, links people together allowing them to be affected by one single action. One thing I absolutely loved about Dishonored was its variety and choice—that it catered for both gung-ho and non-hostile approaches. With two playable characters that can now hold conversations, it seems Dishonored 2 is sure to handle this better still. Dishonored 2 is due to launch November 11.